Ricki Peraua nodded in a loose ball in the first half and Cameron Robertson doubled the lead with a well taken free kick shot in the second spell of the match for Titikaveka. Titikaveka dominated the first half but a revived Avatiu outfit came out firing after the break and, while an initial hail of long range efforts tested the Titikaveka goal keeper but the hosts eventually got on the scoreboard with ten minutes of play remaining when Tahiri Elikana slotted through their sole goal to bring the score at two goals to one to Titkaveka at the full time whistle. Avatiu tried tirelessly to level the score but time had run out with Titikaveka being pleased with the result. “The first half was pleasing in terms of dominating the game,” said Titikaveka captain James Nand. At the other venue Tupapa defeated Matavera by four goals to nil through Campbell Best who scored a double for his team while Paavo Mustonen and Grover Harmon added their goals to the Tupapa tally. 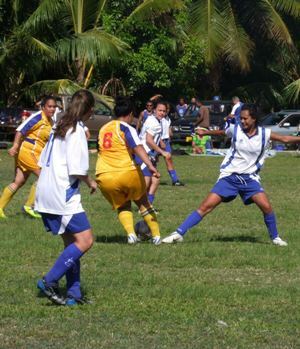 In the main match of the CIPS Image & Copy Centre, Avatiu narrowly beat Titikaveka by one goal to nil through second half substitute Jessica Puiri with ten minutes of play remaining. Titikaveka put up a good challenge against Avatiu but were unable to place the ball to the back of the net. In the other match Tupapa went on an onslaught by demolishing Matavera by fourteen goals to nil at Victoria Park. In the junior divisions, Avatiu winning convincingly over Titikaveka in the under 14 boy’s and girl’s games while Tupapa beat Matavera in both grades. In the under 17 men’s competition Nikao Sokattak thumped Takuvaine by five goals to nil while Matavera cruised to victory by three goals to nil over Avatu. In the last match of the day Tupapa Maraerenga defeated Titikaveka by five goals to one.